Responsive design, or simply ‘responsive’, is a buzzword you may have heard of recently, but do you know exactly what it is and how it can help your business? Responsive design is a web development term used to describe a website that has been built with the ability to not only resize, but also restructure, its content to suit any number of different screen sizes in order to improve functionality and the overall user experience. Responsive design is important because the way we use the internet has of course changed – browsing the net with smartphones, tablets, and even TVs, is increasingly becoming the norm over the traditional desktop. A non-responsive website viewed on your smart phone, tablet, laptop and desktop would adopt a one size fits all approach. On larger screens you may have large expanses of white space around your website, on smaller screens the website may shrink to fit, the user may need scroll a lot to view your complete page, or zoom in and out to different areas which all make for a very unusable site! Obviously this can negatively impact the user experience, their overall opinion of your business and deter repeat visits. If you’ve ever had to use a non-responsive website, and you probably have, you’ll understand how incredibly frustrating this can be! Although a responsive website takes more time to design and develop, as varied layouts for multiple screen sizes need to be considered, the benefits are definitely worth it. No matter what device or screensize your website is viewed on, it’s important that your user experience is fast, simple and easy, and your vital details are easy to find. Responsive websites allow the most relevant elements to be clearly seen on each device type. Responsive websites are not only good for the user, they can also improve your Google search ranking, with Google announcing its preference for user-friendly responsive websites in June 2012. And who doesn’t want to be found more easily by potential customers? Data collated from websites Algo Más has developed show that smartphone and tablet usage to view our client’s websites is already 30–50%. A significant number that is expected to rise. 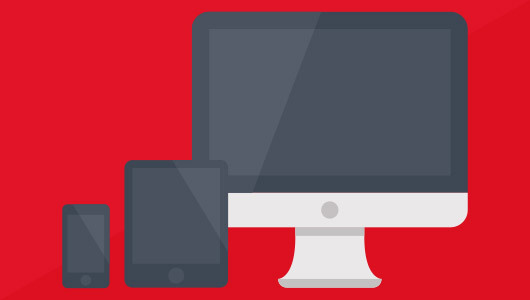 Are you making use of responsive designs? If not, you are losing out on a potential competitive advantage. By staying ahead of your competition and upgrading to a responsive website you have the opportunity to build on your customer base, and take online market share from businesses that fail to even consider a responsive site. If your business needs assistance moving to a responsive website please speak to us about website design, a more intuitive Content Management System (CMS), improved SEO and staff CMS training.